The schwa sound is a soft quiet guttural sound that comes expelling a little air from the belly. You can make this sound if you pat yourself on the stomach. It also sounds like the kind of grunt that a moody teenager might make first thing in the morning as a primitive form of greeting – ‘Uh’. The schwa sound is not unique to English and occurs in a variety of languages, from Russian to Dutch, and Indonesian to Hindi. Perhaps you use the schwa sound in your language. Using the schwa sound is quite natural for native speakers of standard English pronunciation, and the average speaker would very likely not be able to tell you what a schwa sound is or why they pronounce English as they do. It is different for students of English – you have to learn to use the schwa sound consciously. In the latter case we need to say the sound as quickly as possible, without stressing it, so as not to draw attention away from the stressed vowel sound – the long vowel sound ee in the middle of ‘casino’. Unfortunately, students often learn the full form of English words – without any schwa sounds – from their teachers from childhood onwards, and then carry the multiple pronunciation errors with them throughout their whole education and into adulthood. 5.2.3 It is typical of the chaos in English spelling that there is no dedicated vowel letter for the schwa sound – the most common vowel sound of all in English! Instead we need to use any of the five vowel letters to represent the schwa sound – often in different combinations (see 5.2.1 above). In Clear Alphabet (see Lesson 1.6 Clear Alphabet) the schwa sound can be written either as uh or it is embedded with the consonant sound. We use the digraph uh to signify a schwa sound that stands alone, e.g. the first syllable in ‘above’, which we write phonetically in Clear Alphabet as uh Buv. However, most of the time the schwa sound is embedded, because all consonant sounds in Clear Alphabet are naturally followed by a schwa sound. For example, if we write ‘doctor’ phonetically it looks like this: Do kt. 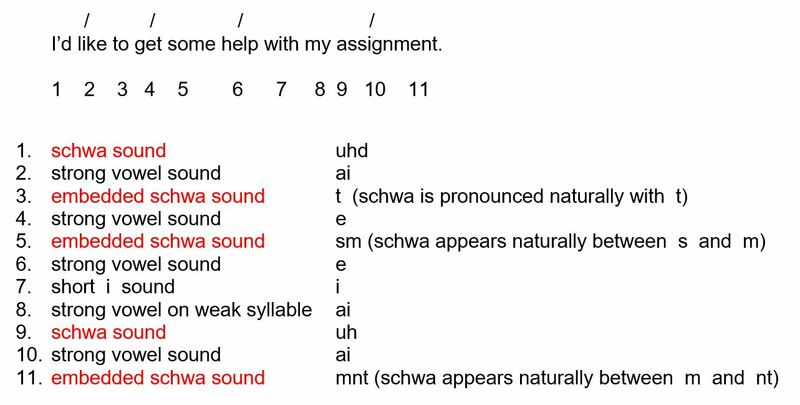 We do not need to write the schwa sound after the t sound, because it is heard naturally when we say t. Similarly, when we write Tee ch, the schwa sound occurs naturally after the consonant sound ch, so we do not need to write it: Tee chuh. We also hear the schwa sound in the first syllable of two-syllable verbs which are stressed on the second syllable. This is a large category of English verbs. There are some good examples below. elephant is pronounced E l fnt – the second and third vowel letters are schwa sounds rather than being pronounced as they are written, so not E Le Fant but E l fnt. If the student does not use schwa sounds in their spoken English, and does not learn how to do it, they will definitely make numerous errors every time they speak – ten errors, in the case of this sentence. That is how serious this topic is. No schwa sound = no correct pronunciation, so it is well worth taking the time to learn when and how to use it. ‘When’ will be often – in almost every sentence – several times – and in most words. Note: the exception with weak forms is when a function word comes at the end of a sentence or main clause, when it will be full form. For example, in the sentence ‘Where did they go to?’ ‘to’ will be pronounced like the number Too, rather than with the weak form t, and in the sentence ‘What are you waiting for?’ ‘for’ will be pronounced like the number For, rather than with the weak form f.
5.2.8 The disconnect between English spelling and sounds means that students have to be aware of features of spoken English like the schwa sound (and glottal stops), if they want to be understood clearly and to sound natural. For example, the word ‘government’ makes a lot of sense in written English: it is a verb infinitive (govern) + suffix (-ment). A suffix usually changes a word into a different kind of word, e.g. in this case from a verb to an abstract noun: govern -> government. The problem is that the ‘logical’ spelling does not help a learner to pronounce the word correctly, but many people believe that spelling is supposed to be a phonetic representation of a word. That would be ideal, and it certainly is the case with Clear Alphabet. Spelling and sounds match perfectly: Gu v mnt. The result is that the listener hears too many stressed vowel sounds and has to decode the words they are hearing in their head as the student speaks. There is a short delay in understanding the student. If this continues, e.g. for ten minutes of conversation at a party or a meeting, the listener may quickly become tired and make an excuse to go and speak to or listen to somebody else. The student may feel disappointed that they did not communicate effectively. 5.2.9 Let’s look at this disconnect between spelling and sounds in more detail. The fact is that in English we often write one thing but say another. If we take the word ‘cinema’, the spelling indicates that there are three strong vowel sounds: i e a. The student may be tempted to pronounce each one, giving the word three strong syllables and no correct word stress. It may be that they learned this word from their teacher at school with three strong-stressed vowel sounds. But if they pronounce ‘Si Ne Ma’ without one clearly defined stressed syllable and two schwa sounds, their pronunciation will be incorrect and potentially confusing for the listener, who might be listening attentively for the stressed vowel sound i in the first syllable: Si, followed by two dud, empty sounds. Don’t disappoint them! Effectively the word is: Si duh duh. We largely understand it as ‘cinema’ from the stressed vowel sound and the context. As we mentioned above, if the student makes errors with schwa sounds and stress several times in every sentence – adding emphasis and loud strong vowel sounds on every or most syllables – the effect can be very tiring for the listener, whose brain may be naturally demanding to hear the correct sound spine (the sequence of stressed vowel sounds in a sentence – see Lesson 2.5) rising above a quiet mumbling of schwa sounds and other weak sounds – NOT. E. VE. RY. SY. LLA. BLE. STRESSED! The student’s level of communication is reduced disastrously by not using – even refusing to use – stress and the schwa sound. Accept that the schwa sound is real and needs to be used when speaking English. For many students the schwa sound is a new topic and there can be resistance when they realise that the way they currently pronounce English – without the schwa sound – is full of errors. Accept that your listener needs to hear the sound spine of the sentence clearly. Aim to hit the correct vowel sounds on the stressed syllables and reduce all the other syllables. When you learn a new word or set of words, learn not only the spelling of each word but also the pronunciation: which syllable is stressed? 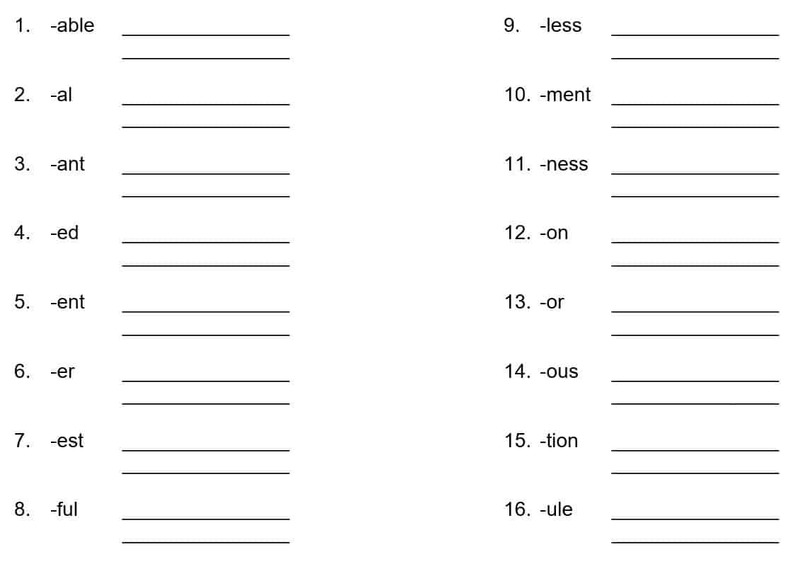 What happens in the rest of the syllables, which are weak? Are there any schwa sounds, short i sounds, short ii sounds, or strong vowel sounds on weak syllables? Use a dictionary to help you see what happens in each syllable. Get to know the IPA symbol for the schwa sound. If possible, use an online dictionary, spellchecker, or app that allows you to hear the word spoken with standard English pronunciation, rather than a mechanical voice. Listen and repeat the words. Get used to using the schwa sound instead of strong vowel sounds as they are written. Improved pronunciation will come with patient study, time and practice. Practise saying the weak forms of function words out loud: th instead of thee, uhnd instead of and, uhz instead of az, and so on. Get used to the fact that function words will be reduced with weak forms in a sentence, rather than full form when you say them on their own. Be more aware of places where the schwa sound usually appears, e.g. in suffixes like -tion, -ment, -ance, and so on; in function words like the three articles a, an, and the; in common prepositions like to and for, and in words with the prefix a-, like again and above. Be suspicious of long words, e.g. four-syllable words. Only one syllable is stressed in each content word. How many of the rest of the syllables are schwa sounds? Listen to native speakers talking and start to recognise the weak schwa sound. If you do not know any native speakers, use resources such as YouTube to listen to authentic English speech. Get used to hearing that familiar uh sound, rather than expecting to hear English spoken as it is written – or as you learned it at school – with full vowel sounds, that do not appear in real spoken English. Use the schwa sound, stress, and the sound spine. You can be sure that what you do consciously today, you will do more naturally in the future – without thinking about it! a) Do you have the schwa sound in your language? What are the similarities and differences in how you use it, compared with English? b) Have you learned about the schwa sound before? If yes, when? What did you know about it before this lesson? Do you already use the schwa sound when speaking English? If not, why not? Did you already know about and use sentence stress and the sound spine? If not are you going to use them when speaking English? Why? / Why not? c) Do you have a problem with pronouncing the schwa sound? How can you improve your skill in physically making this sound? How can you increase your understanding of when to use it? d) Have you noticed English native speakers using the schwa sound – either in real life or on a TV show or film, e.g. on YouTube? b) Say each word out loud 5 times, paying particular attention to the schwa sound. Learn them and repeat them often, to help you get used to saying the schwa sound. Ex. 5.2.3 Pronunciation Write ten more English words that contain a schwa sound. Where is the strong-stressed syllable in each, and what happens in the non-schwa sound weak syllable(s)? Practise pronouncing them – paying particular attention to the schwa sound. Use a dictionary if necessary. I) Paul’s brother loves listening to classical music on the way to work. II) David is clearing the ice from his car windscreen. III) Cathy forgot to take her umbrella with her to work this morning. IV) Jean was riding her horse in the field for half an hour this morning.